Thank you for your interest in SunShop. From here you can test-drive both the storefront and the administration back-end. Feel free to test every aspect of the product and make any changes you’d like. All changes you make using the administration back-end will instantly affect the storefront within the demo. Please note that the demo will automatically reset every hour on the hour. This demonstration allows you to see SunShop from the customer’s perspective. Through this demo, you can try out all of the features available to your customers and simulate a complete order exactly as your customer would. 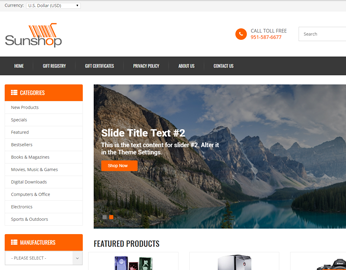 While viewing the demo, keep in mind that SunShop is highly customizable, so your cart will likely look a lot different from the default layout. 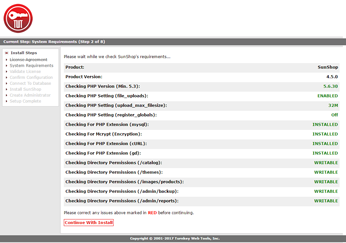 This demonstration allows you to manage SunShop using its easy-to-use administration area. Every aspect, including the design and layout, can be controlled in this area. 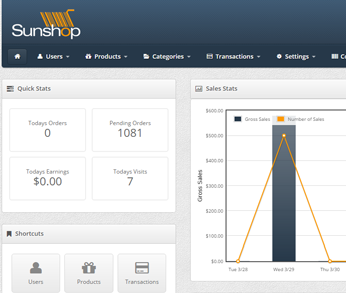 SunShop offers an intuitive, quick-load administration interface that will significantly cut down on maintenance time. Any changes made will be reflected in the storefront instantaneously. Please note that this demo is frequently accessed by multiple users at the same time, so you may see their changes as well. This demonstration allows you go through a complete SunShop installation through its efficient web-based installer. Although the demo installation settings come pre-set, a real install takes only about 5 minutes to complete. Although some of this may look new to you if you’ve never performed a web-based installation before, please know that we are here to assist you and would be happy to walk you through the installation process when it comes time for you to install SunShop. We also provide Professional Installation services should you wish to have us perform the install for you.